In this tutorial I’m going to show you how to migrate your email messages to Winhost using the SmarterMail’s Mailbox Migration tool. You must still have access to your current mail server’s POP3 service. You need to know settings from the current email hosting provider to connect to your POP3 service. Your domain name may still need to be pointed to the other mail hosting provider in order to retrieve your mail messages. The email user(s) will need to be created on our mail server before you begin. Read our blog post article on How to Create an Email User in SmarterMail. Log in to your SmarterMail interface via Control Panel. You will need to use our mail server’s URL to access the email system since your domain name isn’t pointing to us yet. How do I get my email system’s URL? First log in to the Control Panel on Winhost. Click on the Sites tab at the top. Click on Manage next to the domain name you host. Now click on the Mail box icon. It will provide you with the URL you need to use to log in with each of your email users. It also sets you up to create your email users following the instructions at: How to Create an Email User in SmarterMail. After you’re done creating the email users using the postmaster email account, log out at the upper right hand corner and log back in with one of the email users you just created, one of the addresses whose mail you want to migrate. Expand the Advance Settings folder. This will pop up a new window for the Mailbox Migration. As you can see you have different options to choose from but in this tutorial we’re going to use the option Other. Now place a check mark next to Email and click on the Next button. 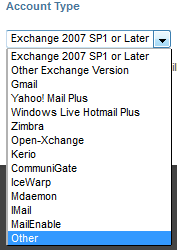 In the account settings you want to enter the information of the current email hosting provider’s POP3 settings. If the connection works then go ahead and continue the migration for each individual email users you created. 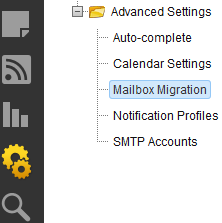 Remember that you will need to log out of SmarterMail and log back in with each user you wish to migrate. It would be very unfortunate to migrate all the email messages from all the email users on a single email account on SmarterMail. So please be careful when migrating and make sure you migrate the correct email messages to the correct user.